Shoestring Elegance: A Fond Farewell! Hello everyone!! I hope you are having a beautiful day!! This past weekend, one of our local favorites, and a five star, "not-to-be-missed!" spot in our quaint little town had to close their doors. It was a very sad loss for us. 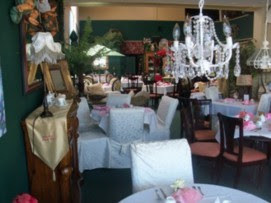 It was a beautiful spot named Jacqueline's High Tea Room. There they had a fully decked out dining room,with private seetings, where one could grab a hat at the door and sit on upholstered chairs in front of tables covered in beautiful rich linens, with fine china and serving pieces in front of you and order a "traditional high tea" or a lovely lunch. It has been the pamper yourself, splurge for many of us for years. My Mother and other family members and friends would often give a trip to Jacqueline's as a Birthday, Christmas or Mother's Day gift, or just a good ole Ladies day out. Well as stated, they have closed their doors and are moving on and I know all from my town and many others wish them many Blessings on their next journey in life. So, why am I telling you about this? Two reasons really: to honor the memories made and shared there and to share some of the wonderful bargains I was able to get at their "Closing Sale". I am super excited to tell you that I was able to find out about this in time to make their sale in their final two days!! Which, as you know me by now, was how I got a "steal" on some absolutely beautiful items!! Always good news to be shared!!! I have shared some of my "treasures" on Shoestring's facebook page and thought, to be fair, it deserved a post all of it's own. So here are a few of incredible finds!! Now, to be honest, I already had the two plates on the bottom of this 3-tiered stand. But, I didn't have the stand!! 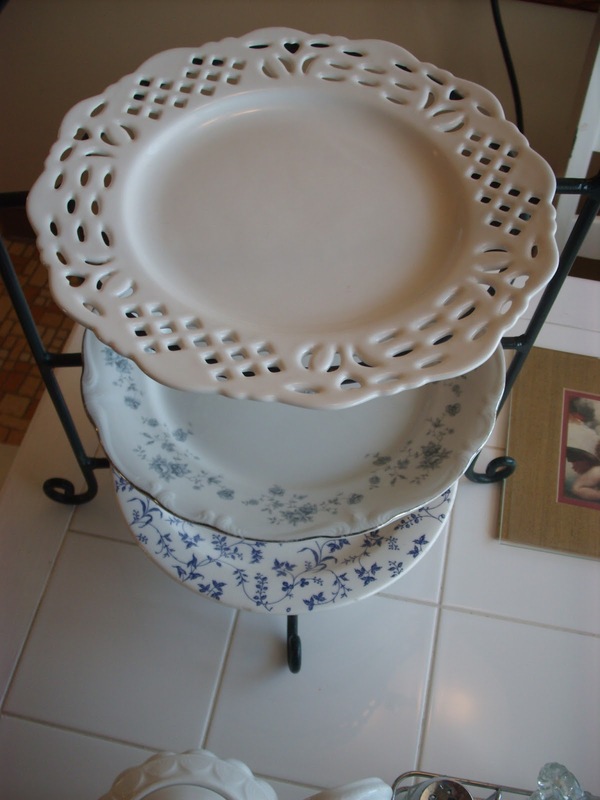 Nor, did I know when I bought those two Beautiful Haviland tea cups that they would be an exact match to the plate that sits now in the middle of the rack. (One I picked up at Goodwill a couple of months ago) Serendipitous, I tell you!! Yay!! Great find number one!! I just loved the look of all my "New" treasures laid out on the table as the sun went down. Okay, if you are familiar with my Blog, I always tell you how good of a deal I got, so that you know, you, too, can get this kind of Elegance on a Shoestring budget. Everything you see on the table I paid a grand total of $28.00 for!! Somehow, that makes them even more special to me.. 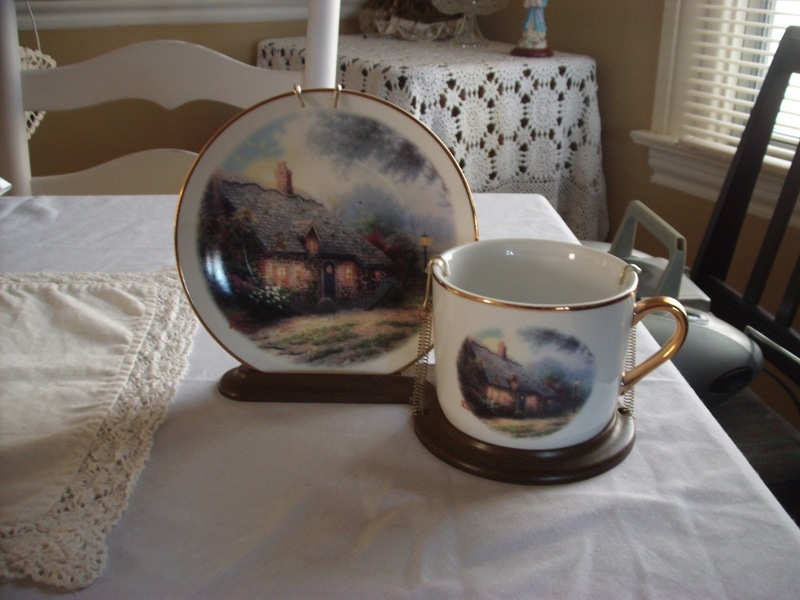 This wonderful Thomas Kinkade commemorative cup and plate "Moonlit Cottage" was a gift to me from a friend I gave a heads-up call to, regarding this particular sale. She did not get out of there for as little as I did, But then again, she has quite a bit more than I to show for it! Thanks L!! Jacqueline's High tea room looks like it was wonderful! How sad it is closing. Your finds are fab! 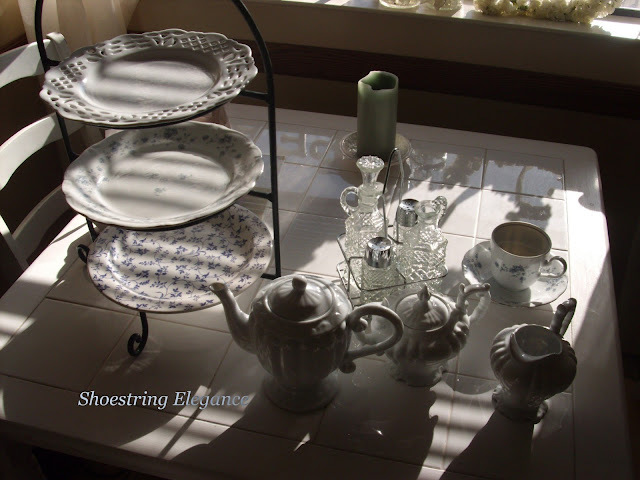 The white tea set will work in so many different ways, the stand, and the plates all beautiful. How great that you found matching tea cups to your plate! You never know what you may find. Terri, I was so happy to get to link up with you!! Thanks for having me. 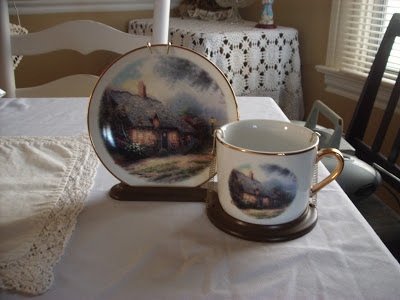 I have a nice little Tea Cup collection and so rarely get to share it on my blog! I appreciate the comment. Yes, so sad to see it go. Lucky to have the bargains and remembrances. 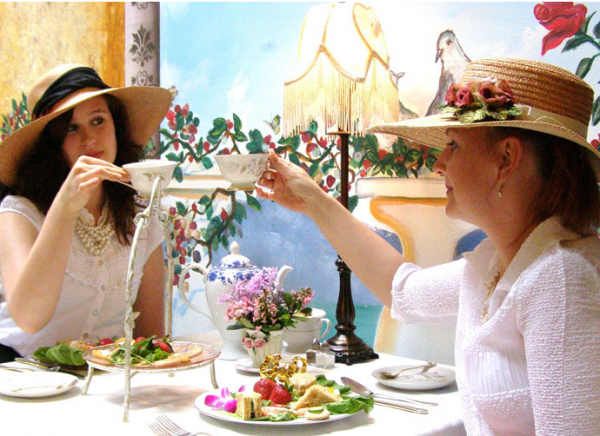 So sorry to hear that Jacqueline's High Tea Room has closed and how lucky you are to have such wonderful tea finds! Good for you! Happy Tea Day! Martha, Thank you for understanding, and the lovely comment!! Thanks so much, Kathy. Yes, I am afraid we have lost a lot of our little favorite spots in this difficult economy. But, we will rebound and find some new favorites! What a lovely tea room and it's too bad it has closed but at least you were able to get some pretties to remember it by. 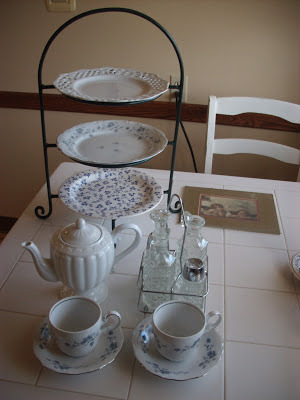 I love your tiered stand and all your china is very pretty. Thank you, Theresa, for coming to tea and for sharing your wonderful memories with us. Thank you so much, Sandi, for your kind comments and for letting me join you this week!! Ans, yes, I did get some wonderful memories to keep. You were able to pick up some nice things for tea. I wish I could have bought some treasures from our one and only tea room when it closed 2 years ago. There are fond memories though of taking many friends there for the first time and how they enjoyed being treated royally. It was also my husband's first trip to a tea room and I told him sure, you can order beer and wings! :-) He has never let me forget having to sip from a teacup and hoping no one saw him in there. Thanks so much. I see, then you understand exactly! I love it when we get our men to enjoy simple pleasures...I take it he has not returned to a Tea Room again?! LOL.. Thanks for sharing. You really SCORED BIG on this one! Good for you! Your purchases are beautiful! It's too bad they didn't offer it for sale instead of just closing the doors. But maybe someone else will open up another one! You can only hope! Thank you so much, Marty!! So glad to see you here!! Hugs and Blessings to you and yours. Thanks for TTT!! I'll try! thank you for the invite, Lisa! New project posring in the a.m. 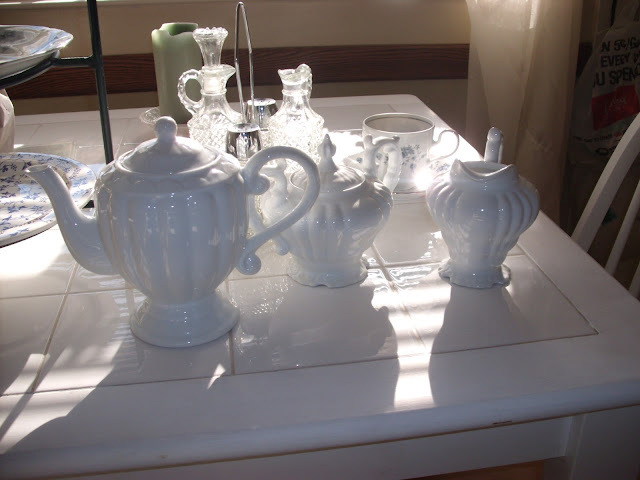 So sorry your wonderful tea room had to close, but love the things you were able to purchase to remember them by. Saw your link at Be Inspired, thanks for sharing with us. So sad to see those special places close. So many are one of a kind! You did bring some great treasure home, and it sounds like some wonderful memories too! Yes, Shannon, I agree. This place was a "one of a kind". I am grateful for my wonderful little treasures, yet will still miss this Tea Room greatly. Thanks for popping by! I love all the beautiful treasures you picked up!! !